Terrible title but it had to be done! Have been a bit slow in finishing these but got them done last night. I made them a bit bigger and modified the pattern a bit to get them right for me. 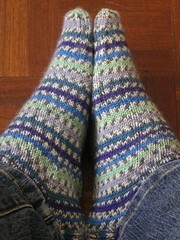 Am planning to do some more stripey ones with some yarn I have from 21st century yarns. Have also got about halfway up the armhole of the back on Mist. It was always going to be slow going but I’ve got to make myself do some every day or it’ll never get done.